Mark’s first love has always been music. He was the bass player in a local heavy metal band while attending university, until he turned his full attention to his legal career in 2013. Mark attended the University of Alberta for most of his post-secondary education as it was the closest university to his Northern Alberta roots. He received a Bachelor of Arts in Philosophy and Political Science in 2010 and a Juris Doctor degree from the U of A Faculty of Law in 2013. He then articled with a large corporate-commercial firm in Edmonton, but soon found his true calling in family law. 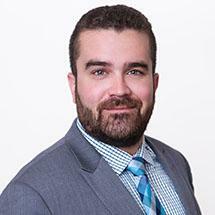 He has been with Long Family Law Group LLP since he was admitted to the Alberta Bar in 2014. While Mark is an Alberta boy through-and-through, he enjoys travelling, having spent a year living in France during his undergrad. He continues to travel whenever he has the chance. He has played several instruments since he was young and continues to be involved with local politics. Drawn to the law for the opportunity to assist those in need, Mark has consistently shown a strong drive to volunteer, including running a political conference for high school students in Ottawa during his undergrad, volunteering with Student Legal Services while in law school, assisting with several political campaigns, acting as Provincial Court Civil Claims Duty Counsel during his articles, and volunteering with Edmonton Community Legal Clinic as a lawyer. Mark prefers the challenges of litigation but as a child of divorce appreciates first-hand the effects court resolutions can have on a family. Successful at all levels of Alberta courts, Mark strives to employ the long-standing collaborative approach pioneered by Long Family Law Group LLP while still being a vigorous defender of his clients’ interests. He is working towards becoming a Registered Collaborative Family Lawyer, as he believes that not all cases need to be litigated. He will strive to achieve settlement wherever possible.